Spicy Green Bean Makes a Mean Meal! Remember to enter my giveaway for a pair of Sprigs Earbags before it ends tomorrow night! We certainly live in a small world…I recently discovered that my friend Maria of the Glastonbury Rotary Club, who I met through blogging about events of theirs like the Lobster Fest, has a niece (Teresa) who just so happens to be an owner of The Spicy Green Bean here in town. 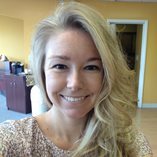 She and her wife Kasha (the head chef) run this hole-in-the wall style restaurant/deli, which is open for lunch on weekdays, breakfast on weekends, and dinner Thursday-Saturday. 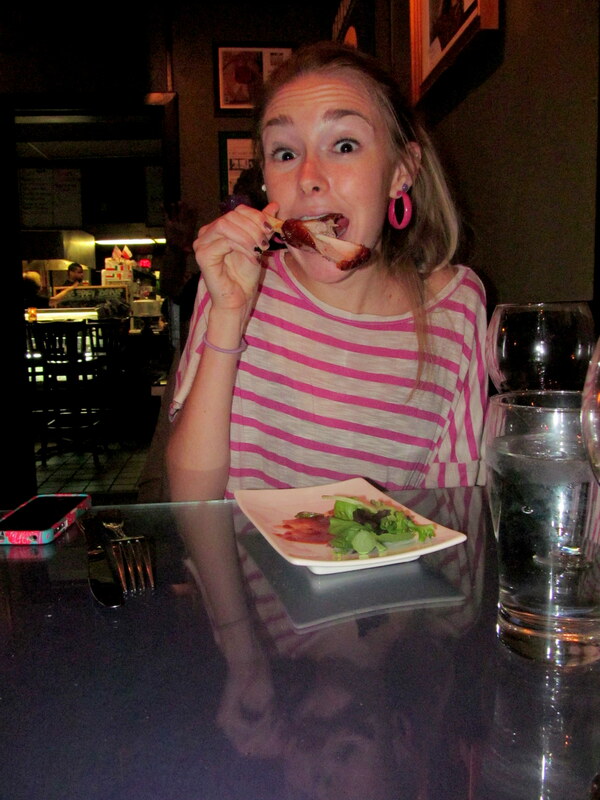 The dinner menu changes every week, so it’s always fresh; it’s also called Kooky Konkoctions, so it’s always creative. Oh, and it’s always BYOB. This place has Caitlin written all over it! 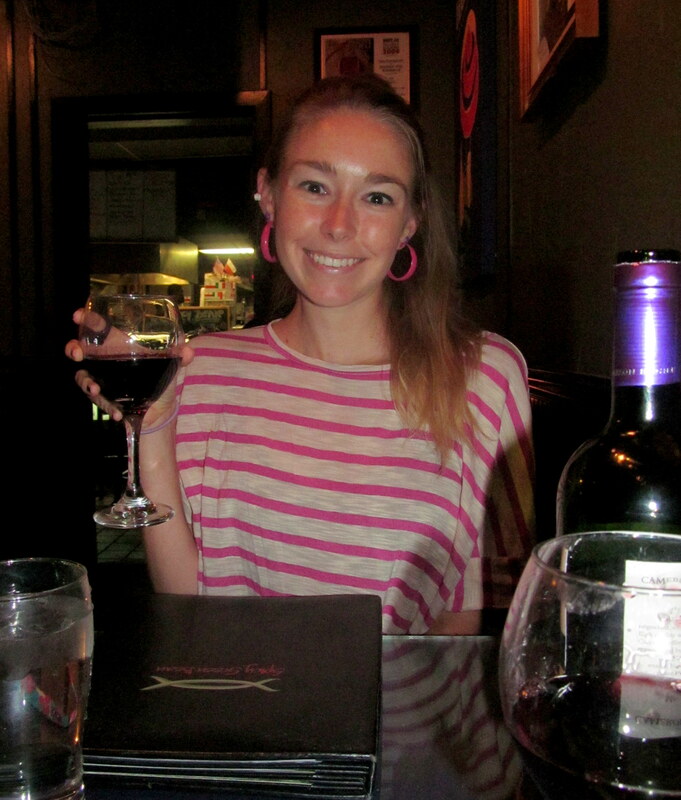 I actually have already been for dinner once before and had a great experience, but after Maria introduced me to Teresa on Facebook one day I offered to come in again so I could write a classic Cait Plus Ate restaurant review. Thankfully, Teresa and Kasha were open to having me – and my mom – for dinner this past Thursday night. Just call her Vanna White! 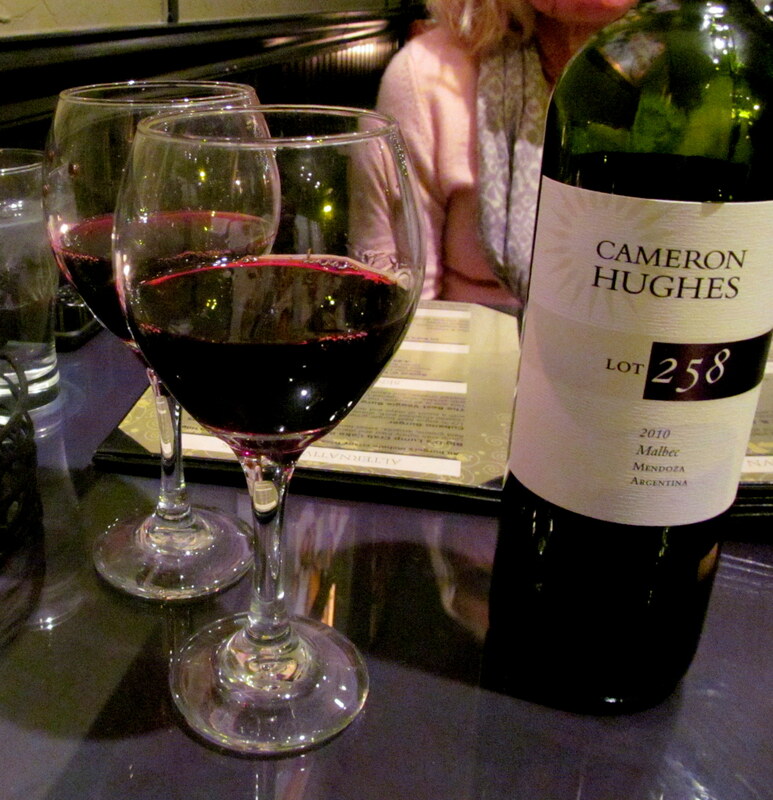 We brought a bottle of Cameron Hughes Lot 258 Malbec (2010, Mendoza, Argentina). Spicy Green Bean charges no cork fee! Upon being seated in the adorable restaurant, my mom and I were served a special surprise from Kasha – her famous shortribs in a spicy BBQ sauce. 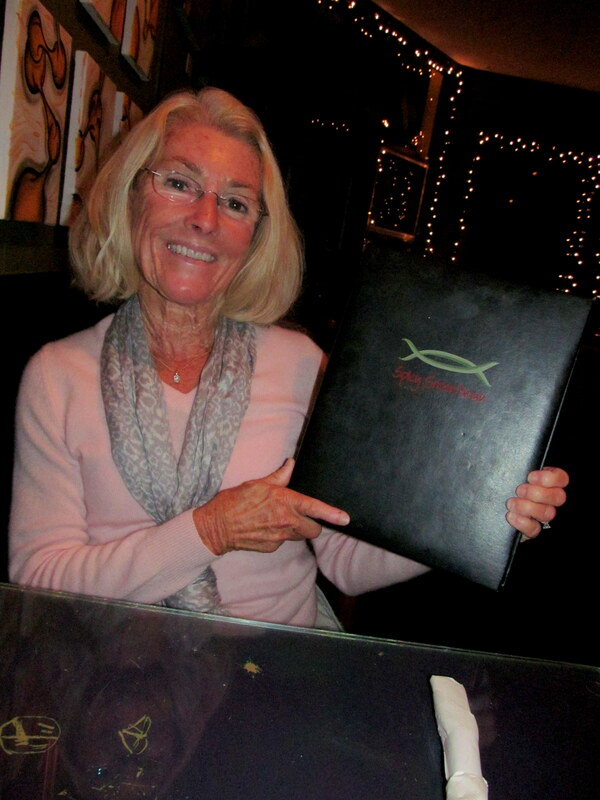 My mom was hesitant to dig in at first – she does not normally join me on my adventurous foodie outings and while she is in love with her favorite foods, she isn’t used to trying new ones without someone to “reassure” her that she’ll like them. Well, I reassured her plenty. 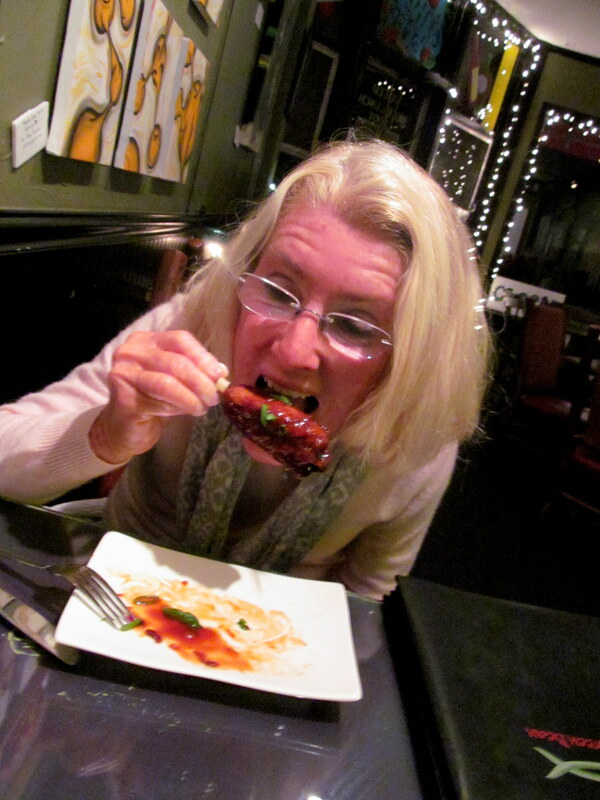 Mom loved these shortribs – and so did I! The meat practically fell off the bone and the BBQ sauce was the perfect amount of spicy. 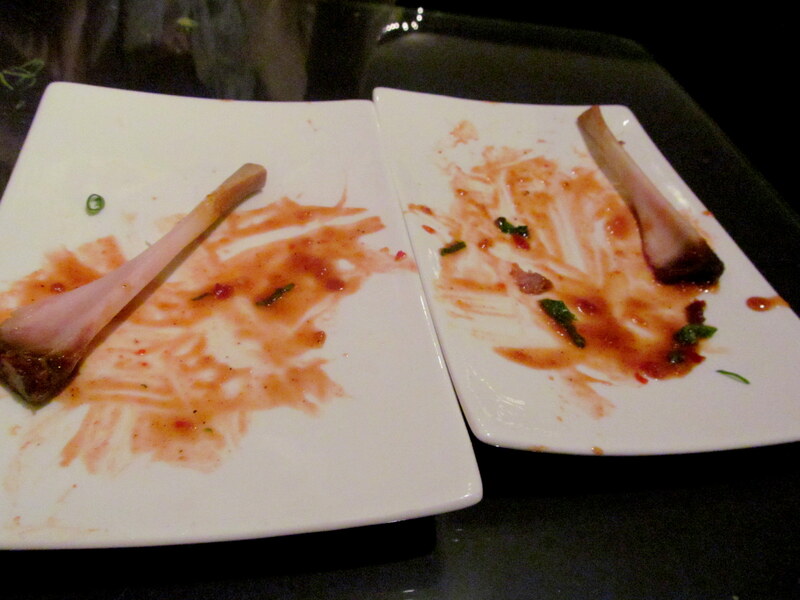 Yes my mouth was on fire after I finished my rib, but in a pleasant way, if that makes any sense. 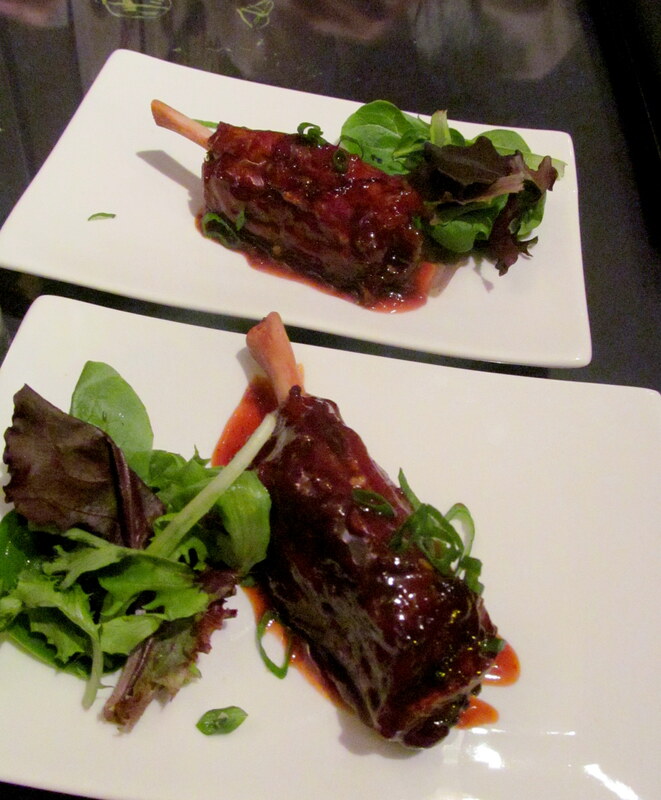 Step one – be served amazing shortribs. 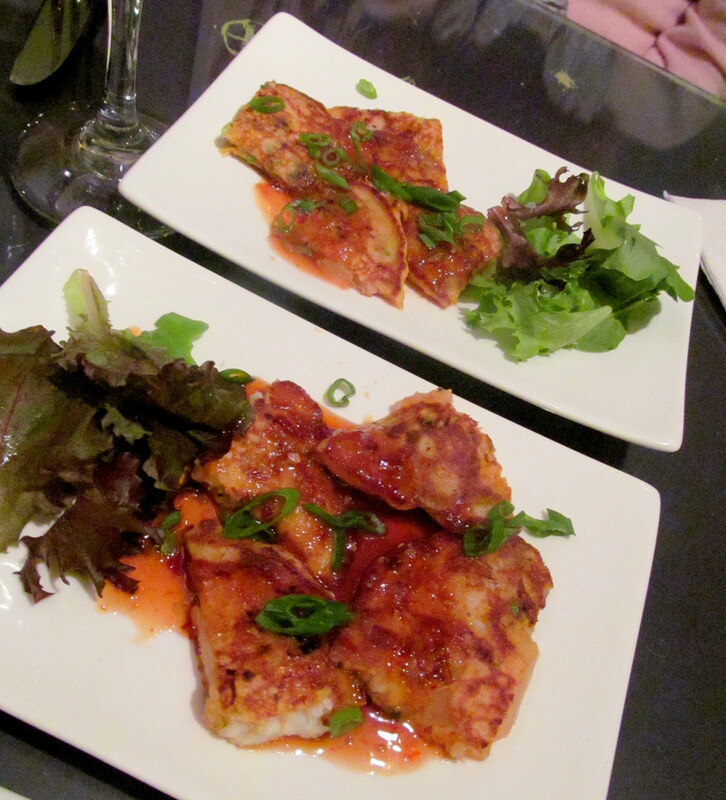 For our next “surprise”, my mom and I were served an app from the week’s dinner menu – Krazy Korean pancakes! Asian-infused batter tossed with shrimp, crab, and tangy kimchi. Lightly fried and served with a soy rice vinegar sauce. I had actually been dying to try this app but didn’t order it with my entree because I didn’t think I’d be able to finish both. So this sampler size portion was perfect! Again, the kimchi gave it a kick, but a fitting amount. I could definitely taste the shrimp and crab, so the dish certainly wasn’t too batter-dominated or overly fried. Some menus lie when they say dishes are “lightly fried”, but Spicy Green Bean is an Honest Abe…they cannot tell a lie! 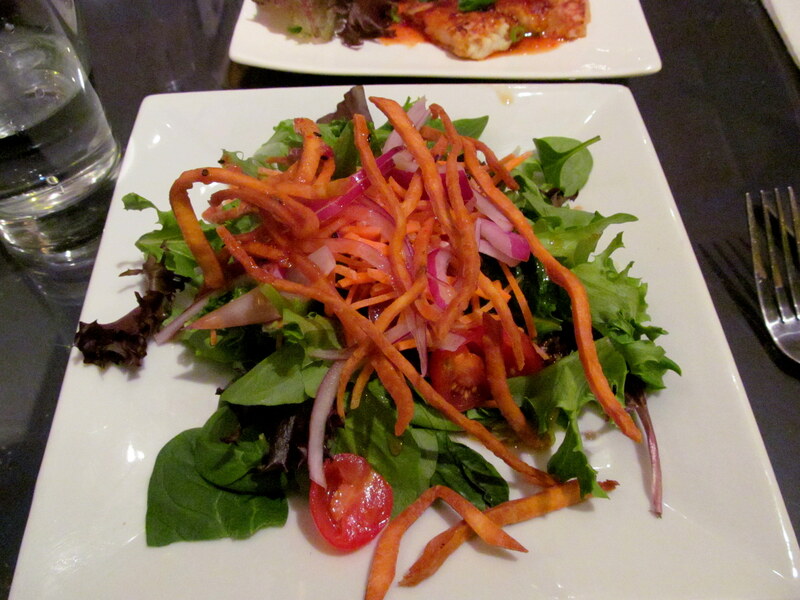 I was savoring and enjoying each bite, a bit too slowly, because my entree’s starter salad came out before I knew it. And what a salad it was! 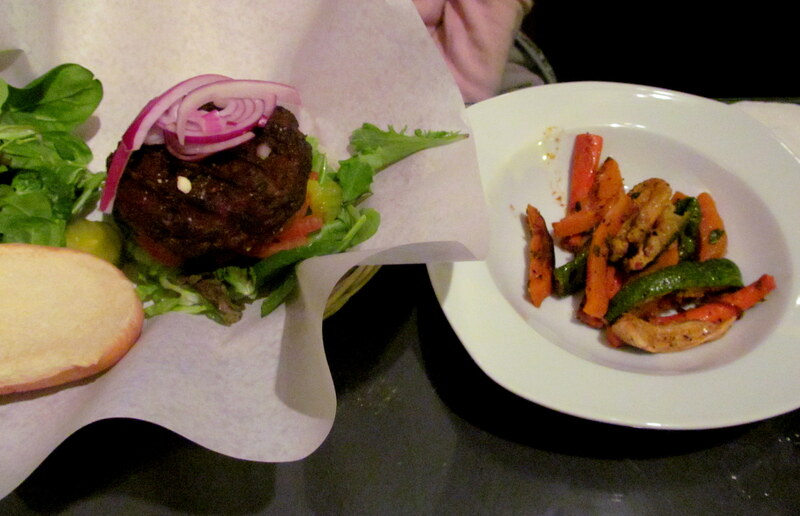 I am always so very impressed by a restaurant that gives me a salad with some meat to it (only no actual meat..). Crispy sweet potato (I think) straws FTW! And the vinaigrette rocked! My mom and I wanted to get in more veggies and go with some #plantPOWER-style sides, but there were not really many on the menu. 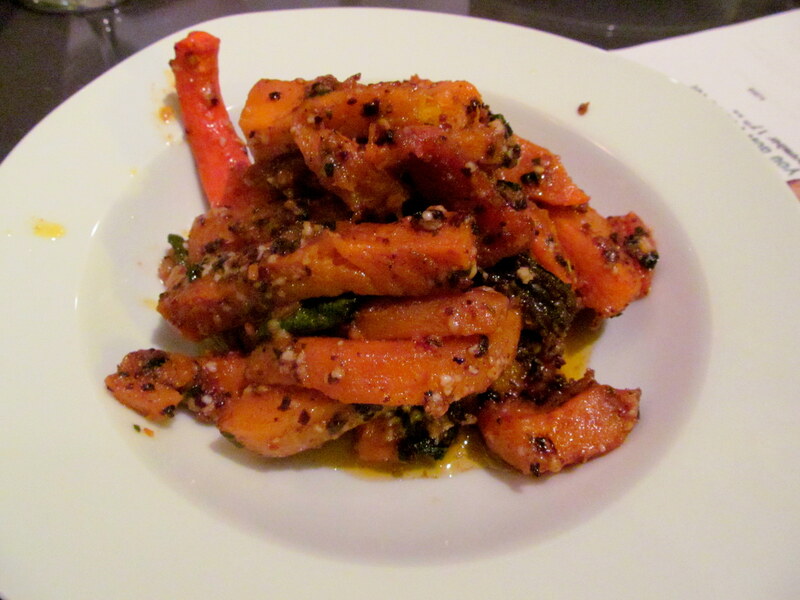 No problem…Kasha kindly whipped us up a root veggie medley to go with each of our entrees. And let me tell you, it was one of the most wonderful veggie sides I have ever tasted! So much garlic, and wonderful EVOO. For her entree my mom chose a sandwich she got on her only other visit to the Spicy Green Bean; she loved it that much she had to have it again. She also shared some bites with me and I can see why! Behold the Bean’s veggie burger topped with pickles, tomato, lettuce, and red onions. With spicy brown mustard on the side of COURSE. An interior with barely any filler, and a perfectly crisp, crunchy exterior. 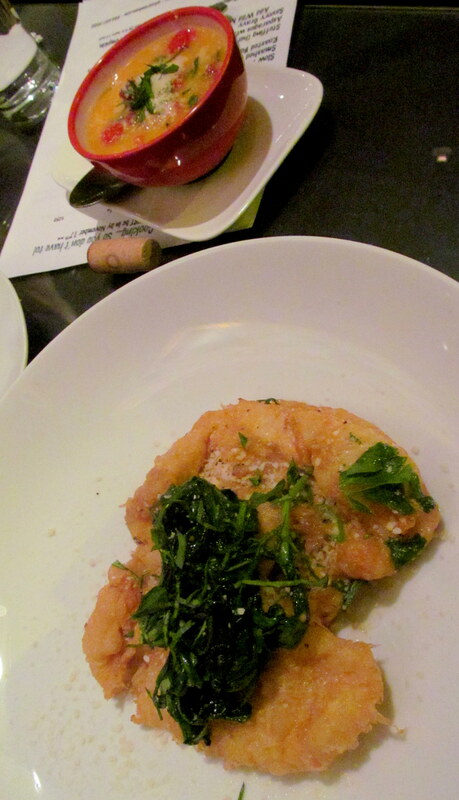 I chose a seafood entree (duh): sole topped with spinach, with the sherried lemon butter on the side. The tomatoes also ended up coming on the side in the butter, but I picked them out and after dabbing off the excess, enjoyed them in all their red glory. I do have to admit that I was a little put off by the fact that the sole came fried. I had asked our waitress at the start of the meal if it was a fried fish, and she told me it was not, just lightly sauteed. However it wasn’t really a big deal because I peeled off the fried portion and enjoyed the white, moist fish flesh within. It’s all good! Cheers to family and food! The Spicy Green Bean also caters and even does Thanksgiving and Christmas dinners! The order deadline for those has passed but my mom and I got a kick out of checking out the tasty (and quite affordable) menu. I wouldn’t mind having the Bean prepare my Turkey Day feast! 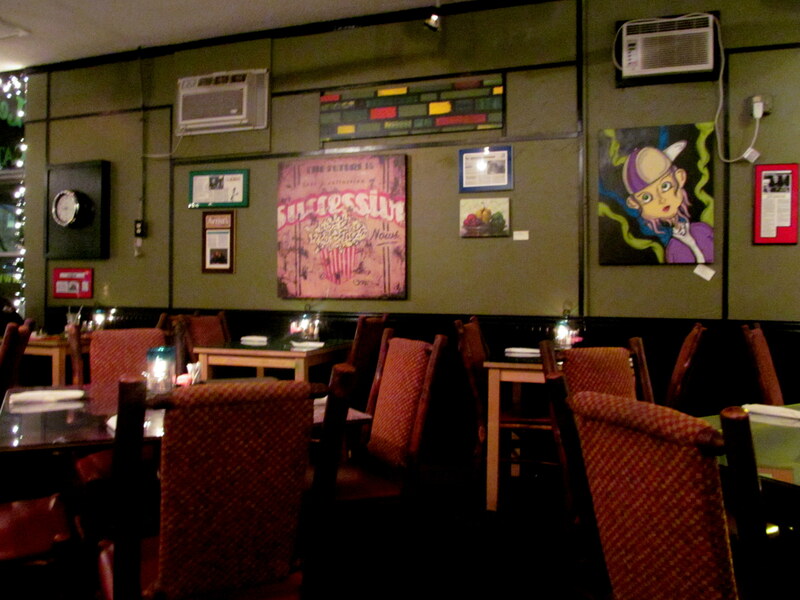 The walls are covered with locally made art by J. Silver Graphics. The originals on the walls are even for sale! Oh, and J. Silver does beer pong tables. You’re welcome for that info. Unique Christmas gift, holla! The white boards on the right list the daily specials and soups. The selection of the latter sounded quite cozy and comforting! 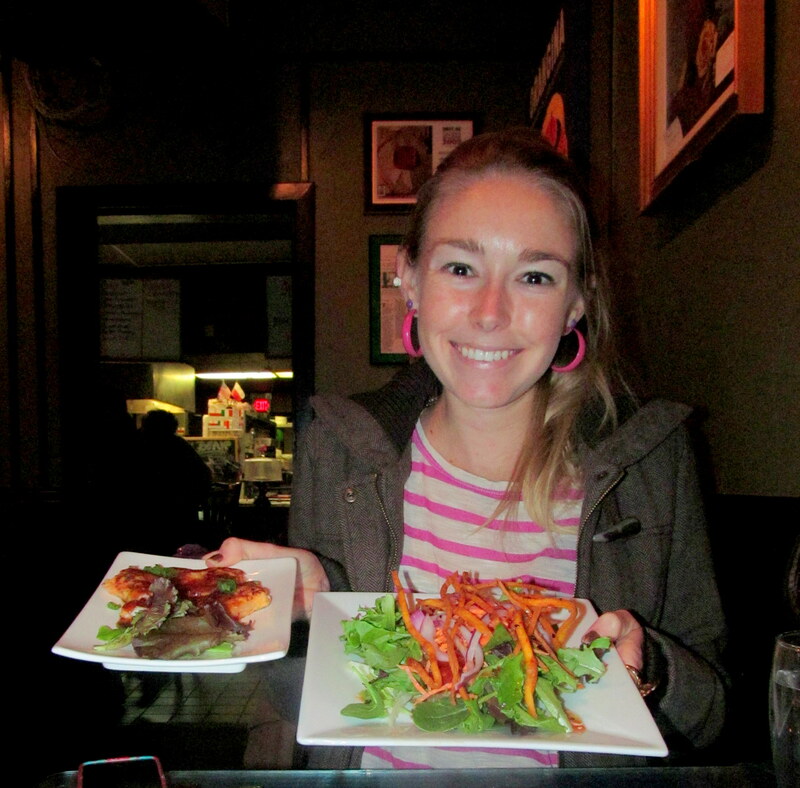 Kasha offered us dessert (and even more foodie surprises…oof!) but my mom and I were too full and declined. We were overwhelmed by the kindness, genuine enthusiasm, and passion the Spicy Green Bean employees have for the restaurant, the menu, the people that come in…everything! I can’t recommend this restaurant enough and am so psyched to finally make it to a BYOB breakfast soon…thank you to Kasha, Teresa, Maria, and everyone else at the Spicy Green Bean who made my night out with my mom possible – and positively palatable! Though I received a couple of samples during this meal free of charge, all thoughts and opinions are completely my own. Which of the foodie features in this post would you most want to try? 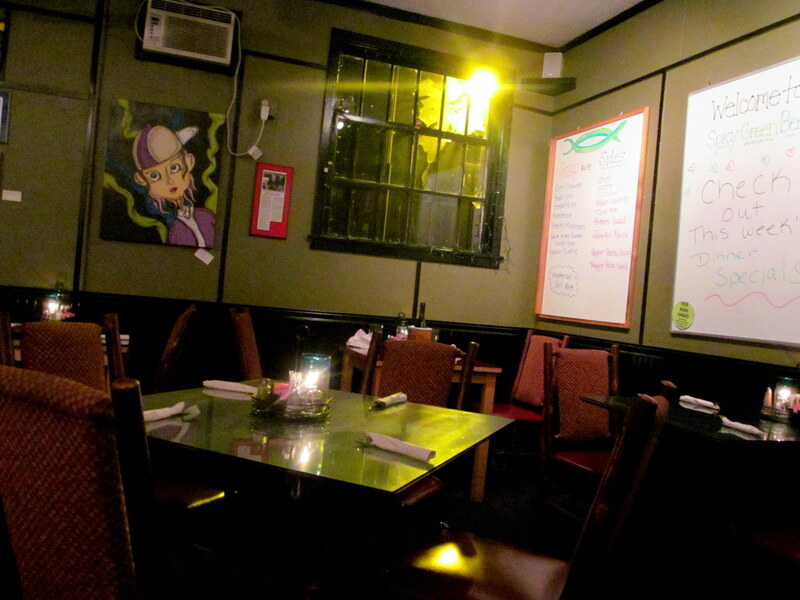 Do you have any local “hole in the wall” style restaurants like this in your home town? How about BYOB?